Canadian man makes Italian food. As the news swirls with epic chills in the Midwest due to a polar vortex that has been altered by climate change, and when rain threatens my California home, it seems like the rib-sticking comfort of risotto is a reasonable response. 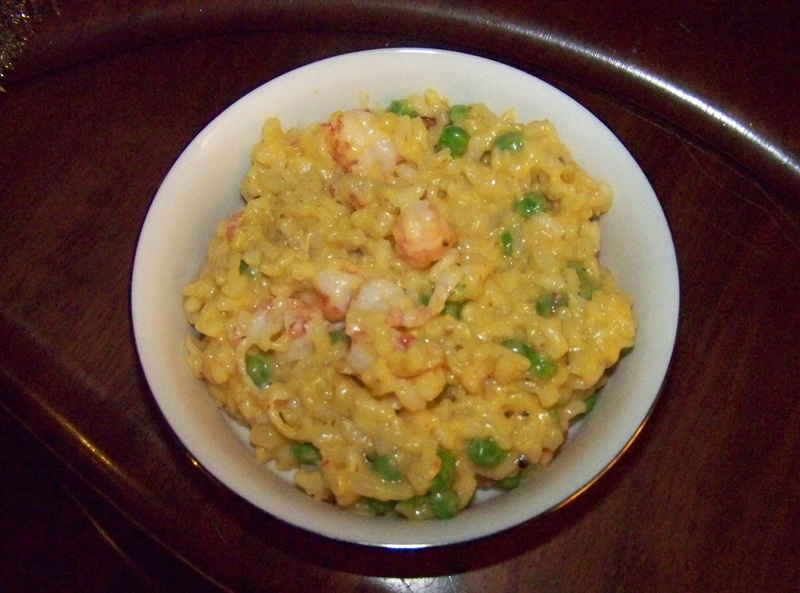 Unlike my previous recipe for Saffron Risotto with Peas and Langoustine, this version was concocted in a cool bit of technology that had barely penetrated the public consciousness back then, and it’s vegan (although for my second helping, I grated a bit of Pecorino-Romano on top, and found it excellent). Full disclosure: Although the idea for combining mushrooms and preserved lemons in a risotto originated with a yearning created in my tastebuds, several blog posts guided my thinking as I developed the recipe. You can find them at the Simple Vegan Blog, Vegan Heaven, Vegan Richa, Vegan Huggs, Chew Out Loud, and the ubiquitous Epicurious. As is often the case, the recipe was developed around existing ingredients; I had some fresh basil in the fridge, it seemed like it would fit in with the other ingredients, and KAPOW, in it went. [One of my #squadgoals for 2019 is to undertake fewer unintentional fridge-based science experiments, a/k/a using ingredients before they stink up the joint.] Same deal with the dried mushrooms; they had been intended for a soup I was going to make for a friend who I later found out doesn’t like mushrooms. The dried mushrooms I used were porcini (Boletus edulis), and an interesting variety known variously as slippery jack, pink boletus, and sticky bun. Although the package referred to them as Boletus luteus, which is their original 1753-era moniker gifted by the legendary botanist, physician, zoologist, and taxonomist Carl Linnaeus, they are now known to be of a different genus and are more properly called Suillus luteus. You are of course welcome to use fresh mushrooms in addition to or instead of the dried. Two other ingredients might be slightly unfamiliar to those with a limited pantry. Nutritional yeast is sold as flakes, granules, or powder, and is often employed in vegan dishes to add a cheesy or nutty flavour. You’ll find it in my recipe for Vegan Potatoes au Gratin, in fact. If your local supermercado carries it, you’ll likely find it next to the spices or in the health food/gluten-free/dairy-free ghetto. If not, well, your local GNC or Amazon. The other possibly unfamiliar ingredient is preserved lemons. Common in South Asian and North African cuisine, preserved lemon is basically a brined or pickled lemon, generally salted heavily and marinated/pickled/brined for a month or so in salt and either lemon juice or water, if liquid is employed. 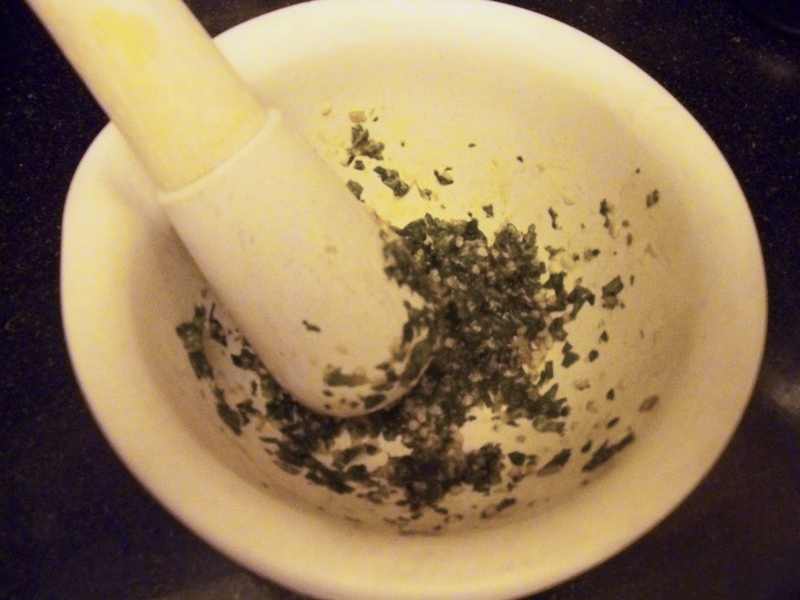 Sometimes spices are added to the mix, but not generally. If you have neither the time, patience, or lemons for this process, they can be found in jars at many Indian, Middle Eastern, or North African markets, should you have such in your area. And yeah, Amazon. But seriously, they are super easy to make and they last a long time, so even if you have to buy a jar to get started, you should make your own, too. Surprisingly, the part you mainly want to use is the peel, not the flesh. Weird, huh? The Instant Pot® doesn’t let you off the hook entirely when it comes to stirring stirring stirring your risotto; it bypasses only about 85-ish percent, which is not insubstantial. And while this method in all honesty may not yield that Michelin-star-worthy risotto of your Tuscan dreams, it gets close enough that I’ll take it on a weekday when I don’t have the Zen-like attitude or schedule that the former requires. “Mushrooms and lemons,” ring the bells of St. Clements. Dice onion, mince garlic, mince preserved lemons. You can chop the mushrooms if you want; I didn’t. Chop the basil and set aside. How much basil? This much basil. When the timer goes off, carefully turn the vent from “Sealing” to “Venting.” [You may want to do this wearing oven mittens; be mindful to avoid the rapid jet of steam that will be emitted.] Turn power to “Off.” When the steam has vented, carefully open lid and set aside. 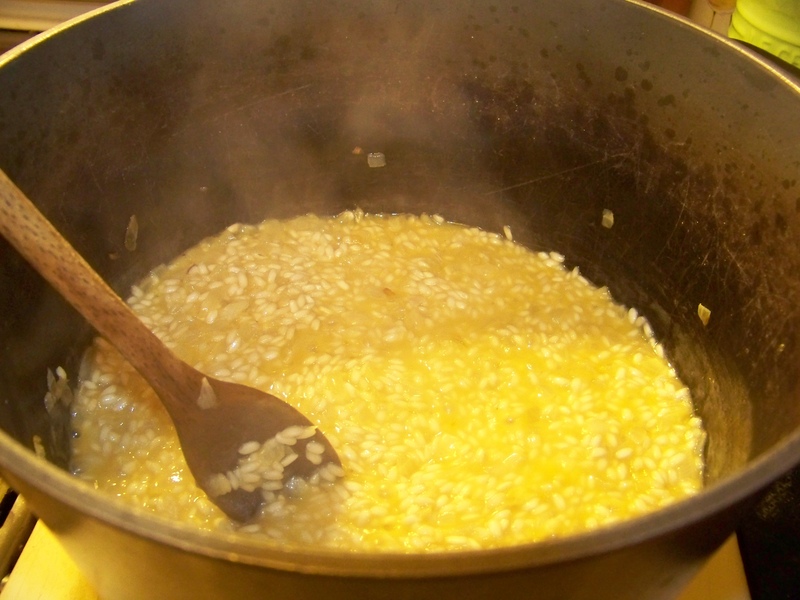 The risotto will look a little soupy at this point, but it will thicken as you stir in the remaining ingredients. Stir in the chopped basil, nutritional yeast, and white pepper a bit at a time, making sure they are well distributed, until remaining liquid is absorbed. Add salt (if necessary), ladle into bowls, and serve. Just like mamma mia didn’t used to make. Miss World 2013 Megan Young pops by Chaaste Family Market. She looks better in a leather skirt than I do. In many ways, Angelenos are quintessentially American by being quintessentially provincial. To be sure, Los Angeles is segregated by politics and wealth distribution and ethnicity, but it is also segregated by zones where people Just Won’t Go. Part of this is a logical response to the most mercurial traffic density in the Continental 48: a journey of five miles can range from anywhere between eight and eighty minutes to complete. So people settle into their zone. Some won’t venture east of the 405, some won’t travel south of the 10, or cross the “Orange Curtain” that divides California’s first and third most populous counties. Santa Clarita? Long Beach? You may as well be on Deimos or Phobos, my friends. It’s only about 19 miles (or 30 kilometers) as the crow flies between the Westwood campus of UCLA and the Rose Bowl in Pasadena (where their team plays its home games in men’s football). And — it’s a bit of an exaggeration, but not much — that’s about the only time (except for New Year’s, obvs) you’ll find a dedicated mass of people from Westwood struggling across town to visit said city. But thanks to a friend’s medical appointment, I found myself in Pasadena, which is gorgeous even when it’s not hauling rose-festooned floats down its streets. It was also, until 10 days ago, the home of the late Jonathan Gold, the only food critic in American history to have won the prestigious Pulitzer Prize. We never met, much to my dismay, even though he was friends with a number of our friends, and I’m sure we could have arranged an intro. And there was the time at the now-shuttered Corazón y Miel — a restaurant his column introduced to us — when the bride and I saw him sit down to a solitary Sunday meal and decided to let him dine in peace. That was also the day that I learned (thanks to his recommendation) deep-fried avocado is spectacular. With a couple of unscheduled hours before me as I awaited my pal Valerie’s eyes to dilate like a Disney Princess‘ and then return to something like normal, I headed out for some east side exotica. And I wound up at Chaaste Family Market. Still life with Honda. Those are spare recyclable grocery bags in the back seat, not the World’s Saddest Balloons. Actually perhaps the least effective marketing campaign on behalf of mushrooms this millennium. The bride said, “You’re not going to bring home a bunch of stuff that you’re gonna leave on the counter for months, are you?” I swore I wouldn’t, but I wouldn’t have placed a two-bit bet on whether I was lying or not. I very nearly returned with a box of “Puto,” which as near as I can tell makes a bao-like dough for steaming and stuffing. Those of you from SoCal or for whom Spanglish is a second language already know that puto has a second, and very different, meaning. This might be the only photo of puto in a box that my website provider would allow me to host. Not 100% sure of tall he iconography here, but it’a a cool mural. What little knowledge I had of Pinoy food was mostly hastily acquired when I was recruited by a chef pal to participate in a relief effort for the victims of Typhoon Haiyan; I was part of the crew he organized to throw a benefit fund-raising dinner. My contribution was calamansi chewies. So, ignorant but open, I placed myself in the hands of my host, something I often do; after all, who better to know what’s good? We moved onto some steam table items, and settled on bistek, beef giniling guisado (which Chris told me his Latino friends refer to as “hamburger helper”), pancit bihon (a dish very like a vegetable-laden vermicelli mix, though it can also feature a variety of proteins), and, of course, the rice. From left, clockwise: bistek, giniling guisado, pancit bihon, rice. Yum. It was a right tasty meal, especially the bistek, whose broth had the depth of a Borges short story collection. Came to a grand total of $8.10, which has to be one of the best under-$10 meals I’ve had in America. Is it worth hacking one’s way through the ugly maw that is Los Angeles traffic to partake of it on a daily basis? Probably not. 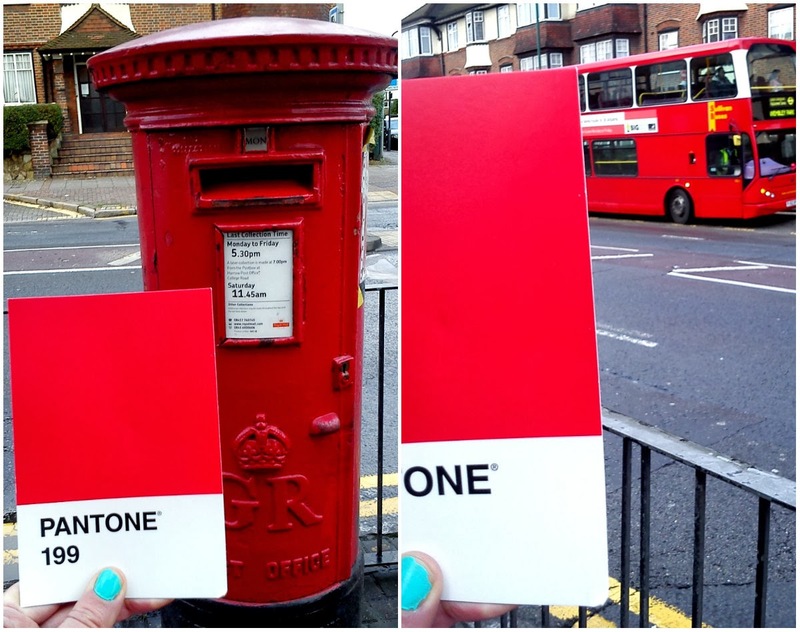 Will it be at the top of my list the next time I find myself in the neighbourhood? You bet. The best of both worlds: Christian halfway between the market and the restaurant. Part of me wants to believe that the omitted apostrophe is entirely intentional, and a nod to the French; after all, Mama’s turon is so good it just flies out the door, so it’s no surprise she would find herself without any. Mama Sans Turon, indeed. It’s like an egg roll and a banana and a churro and some jackfruit went up to heaven and asked if they could borrow some manna and have a baby together. Magic and happiness, fried in tandem. Like clockwork, at 13:30, the shop began to fill with turon fans. The first few were warned not to try them right away, as the turons were just slightly cooler than a meteorite hitting the lower atmosphere. And after I watched several happy clusters of customers drift off, I joined them, turon package in tow, in sweet (and fried) bliss. So by all means do make your way over some day, plan it around lunch, and surprise your couch- (or house-) bound friends with a little manna that found its path from heaven via Manila and Pasadena. This soup was borne out of a need to use up a bunch of celery before it went south. [Seems like I make a lot of “necessity” soups.] Being an enterprising lad, I Googled “celery soup,” and got about 1.83 bazillion recipes for Cream of Celery Soup. I don’t want to demean the good folks whose soup provided Andy Warhol such a rich vein to mine for his art, but the cream of celery soup of my youth was possibly the worst-period-soup-period-ever. It was always the last can in the cupboard, and was only ever served out of dire necessity. To be fair, I think the only reason my mom kept any in the first place was so that it could be used as a sauce for some sort of ’60s casserole that has mercifully and permanently gone out of fashion. Fortunately, my Google Fu skills are strong, and I eventually landed on what appeared to be a terrific recipe by Martha Rose Shulman of the NY Times. It was modified to fit my ingredients, but it’s fairly faithful to the original. 1) You can do this. Goodness knows, I’m no chef. But I can make a tasty meal; that’s all anyone ever asks from an amateur. 2) A recipe is a roadmap. There’s always more than one route to your destination. And, failing that, there are always other destinations. Perhaps the two most delightful aspects to this recipe are 1) you don’t have to pre-cook the rice (a few minutes at pressure in the Instant Pot® does the job); and 2) you can make it vegan simply by removing the Parmesan cheese. If you can operate a knife, a spoon, a can opener, and a measuring cup, you can make this. You don’t even really need an Instant Pot®. It just will take longer on the stove (probably about 45 minutes to an hour of simmering, depending on how quickly your rice cooks up). Doesn’t that look like a bowl full of healthy goodness? And we haven’t even added the tomatoes or the stock yet. Chop up celery, cabbage, onion, carrot, bell pepper, and garlic cloves; place in Instant Pot® container. Sprinkle salt and pepper over vegetables and stir. Add olive oil and uncooked rice to container. Set Instant Pot® to “Sauté” and sweat vegetables, stirring occasionally, for about 10-15 minutes, until they soften a bit. Add chopped tomatoes, vegetable stock, tomato paste, thyme, parsley, and Parmesan rind (if desired — omit for vegan version). Mix briefly with spoon or spatula. Turn Instant Pot® to “Keep Warm / Cancel,” which will end the sauté function. Place lid on Instant Pot®, making sure vent is turned toward “Sealing” rather than “Venting.” Press “Soup” button, making sure pressure is on “High.” Set timer for 16 minutes. Go answer some email or vacuum your front room. When timer goes off, allow Instant Pot® to decompress naturally, or at least for 10 minutes, before carefully switching vent from “Sealing” to “Venting.” Remove lid, and adjust spices as necessary (soup will be hot). Ladle directly into bowls or mugs and garnish with celery leaves and/or grated Parmesan (omit latter for vegan version). Asked the bride last night if she had any ideas for tonight’s dinner, and she responded with, “I pinned some grain bowls on my Pinterest page.” Some people find Pinterest really useful and convenient. I am not one of those. So after I looked through all 266 pins in the “No Animals Were Harmed” folder, I wound up (as I often do) perusing Food & Wine’s website. On it, I found this recipe, for Kale-and-Shiitake Fried Rice. It was pretty close to where I wanted to go, but it had eggs, and I was in a vegan mood, so I made a few simple mods for tonight’s meal. This is super easy to whip together if you already have some cooked rice lying around, so I made a bunch in the Instant Pot last night before going to bed. Obvs, you can use any type of rice, but I find that brown Basmati rice is a good middle path between an insipid white and a cloying brown. The author of the Food & Wine recipe (David Lebovitz) recommended day-old rice, which he says works better to absorb the flavourings. Makes sense, since it will dry out a bit in the fridge overnight. As far as the greens go, I used a mix from the local market, but you could easily add or substitute arugula, collard greens, turnip greens, watercress, or even the leafy part (not the stem) of bok choy. Mustard greens, on the other hand, might overpower the dish, so have a care if you are thinking of adding them. In a wok or large skillet, heat the oil. Add the ginger, almonds, scallions, and a pinch of salt. Cook over moderately high heat, stirring constantly, until the ginger and scallions are tender, about 2 minutes. Add the sliced mushrooms and a generous pinch of salt and cook, stirring occasionally until tender, about 5 minutes. Add the greens, season with salt and stir-fry until wilted, 2 to 3 minutes. Add the cooked rice and stir-fry until heated through, about 3-5 minutes. Serve immediately. Serves 2 as a main course (see bowl in picture), or 4-6 as a starter or side. You can call me Al. Albóndigas. Believe it or not, the red colour comes mostly from the chorizo, not the tomatoes. One inevitable responsibility after Thanksgiving dinner is the disposal of the turkey carcass. Picked clean for sandwiches and goodness knows what all else — tamales? sliders? pot pie? — there’s still a significant heap of bones and attached bits that deserve a better resting place than the rubbish bin. Around our house, we generally made turkey and vegetable soup, but it just seemed too… turkey-ish. By the time we’d gotten down to the carcass, believe me, most of the members of our household were all done with turkey. This year, I decided to make some simple turkey stock (something on the order of four liters, as it turned out, because I wasn’t patient enough to let it condense into what Julia Child called a “semi-demi-glace”). But not for turkey soup. No. 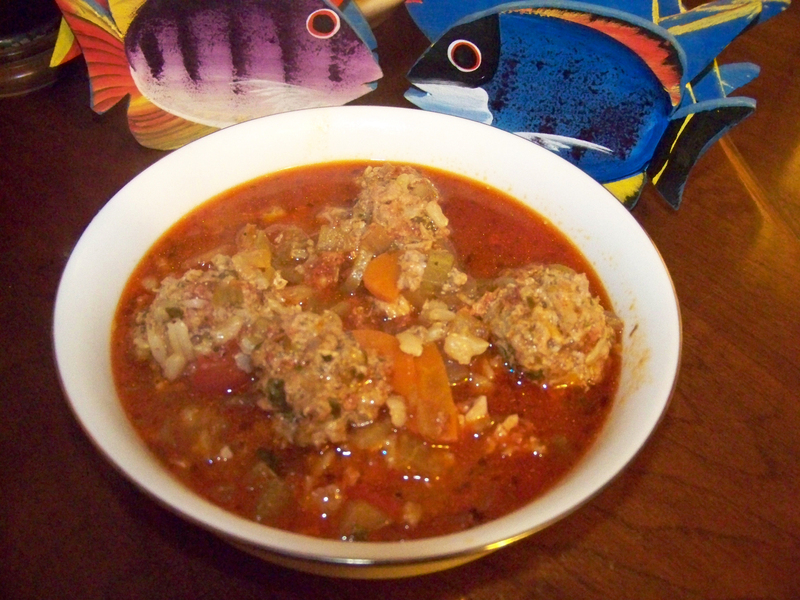 I figured it would make an excellent base for one of my favourite Mexican dishes, sopa de albóndigas (meatball soup). While this soup is decidedly Mexican, its roots go back to the times that Arabs ruled Spain. The word “albóndigas” is derived from the Arabic word for hazelnut, “al-bunduq,” because the meatballs of the era were about the size and shape of said nuts. Their preparation was described in one of the great cookbooks of its day (its day being the 13th century), Kitab al- tabikh fi Maghrib wa al-Andalus (An Anonymous Andalusian Cookbook). Not too surprisingly, the meatballs emigrated to the New World with the conquistadores (along with smallpox and syphilis, albeit with a happier outcome for the locals). The use of mint in this recipe is almost certainly a descendant from a Middle Eastern predecessor, given the region’s historic proclivity for employing the herb as a seasoning for meats. 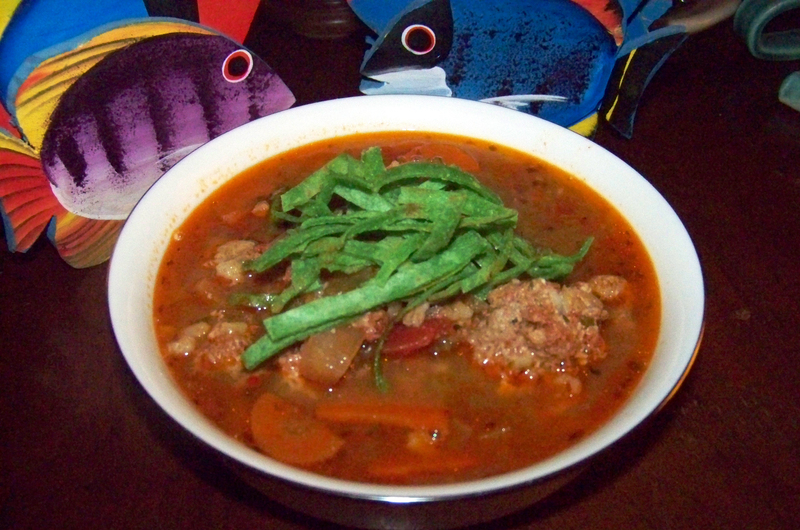 Far as I’ve been able to discover, there are two general schools of thought on sopa de albóndigas. One holds that it’s primarily a tomato-based soup, and the broth ought to be more or less jam-packed with tomato-y goodness and coloured fire engine red (PMS 199); the other is that tomatoes play a role, but not the lead. I opted for the latter. After all, I’d gone to some trouble to make the turkey stock, and I didn’t want it completely buried in the mix. The soup ultimately turned out a rich red colour, but that was thanks to the chorizo, not the tomatoes (as you can see in the picture below, when it was just the veggies and stock). 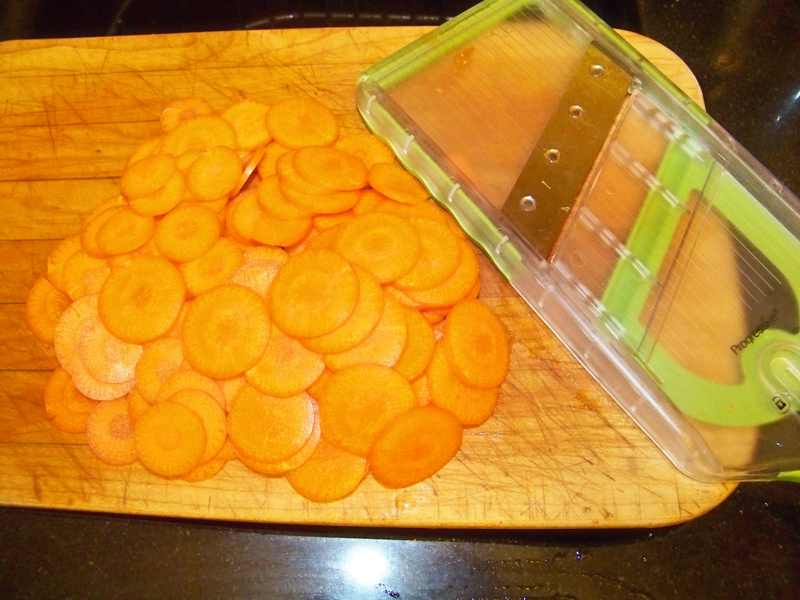 Carrots, planed on the mini-mandoline. I then cut the “coins” in half. Here’s a trick for the rice; just cook 1 cup/180 g of dried rice (I used Brown Jasmine), put 2/3 of it in the soup and reserve 1/3 for the meatballs. Making the broth is super easy; basically, you just dump it all into a big pot, bring it to a boil, and then back it off to a simmer. I let mine simmer for a couple of hours, because I started making it one evening after dinner. [In fact, I put the broth in the refrigerator overnight and finished the soup the following day.] 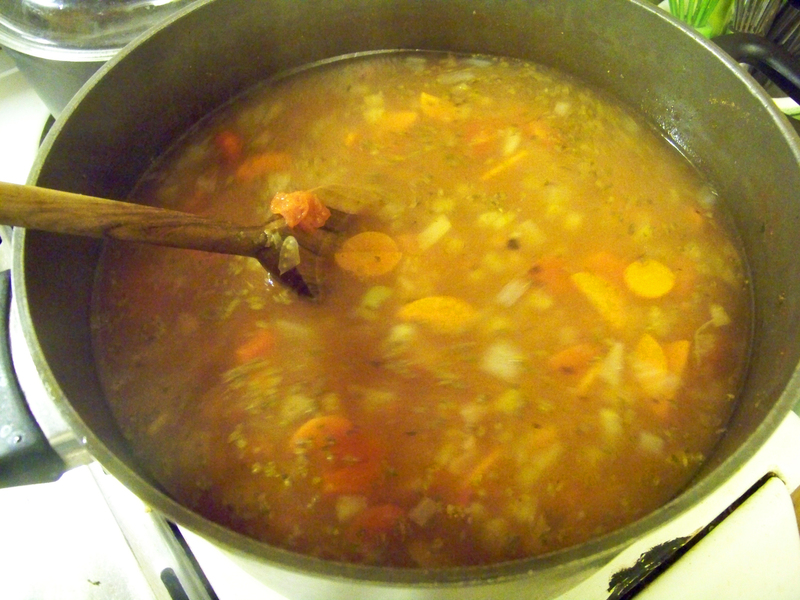 If, however, you are doing a same-day soup, allow it to simmer for about an hour, so you can soften up the celery and onions and carrots, and give the flavours a chance to blend. 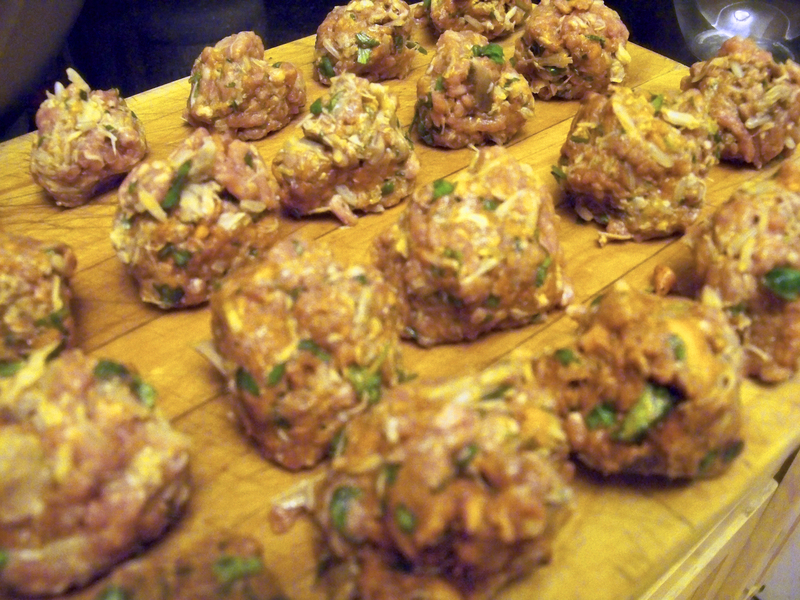 Full disclosure: I had about 100 g of turkey bits that I ran through a food processor and added to the meatballs. It’s not part of the “official” recipe, but it did taste good. Mint and garlic get all muddled up. Some people say to make the meatballs first, but there’s really no need; getting the broth together and letting it simmer will afford you more than enough time to make them. The only trick to assembling the meatballs is that you should mash the garlic and the chopped mint into a sort of paste; otherwise, it’s just a matter of mixing it all up and rolling little meatballs (albóndigas) to about 1″/2.5 cm each. Heat up the broth to a low boil and lower the albóndigas — gently — into the broth. Let the meatballs cook at that temp for 5 minutes, then back the heat off, and simmer a further 20 minutes. Remember, at this point, your chief aim is to cook the meatballs through. That’s why smaller is better. Tiny little soldiers of meat, preparing to parachute into — quite literally — the soup. You can serve it straight, or if you want to get extra fancy, you can make corn tortilla ribbons for garnish. Just quarter small corn tortillas, stack the quarters, then slice the edges into ribbons. Heat 2 tablespoons of oil in a frying pan, dump the ribbons inthe pan and stir until slightly browned. Remove them to a paper towel to drain and crisp up. Sprinkle over soup. With the fried corn tortilla strips; these were spinach corn tortillas, for colour primarily. In what passes for winter in Southern California, one may on occasion wish for a wintry dish, and nothing fills that bill quite like risotto. There are a million ways to make it, but I had a hankering for some peas, and I had gotten a great deal on some frozen (and pre-cooked) langoustine, so I cogitated on what spice might work well with the two of them; I settled on saffron. 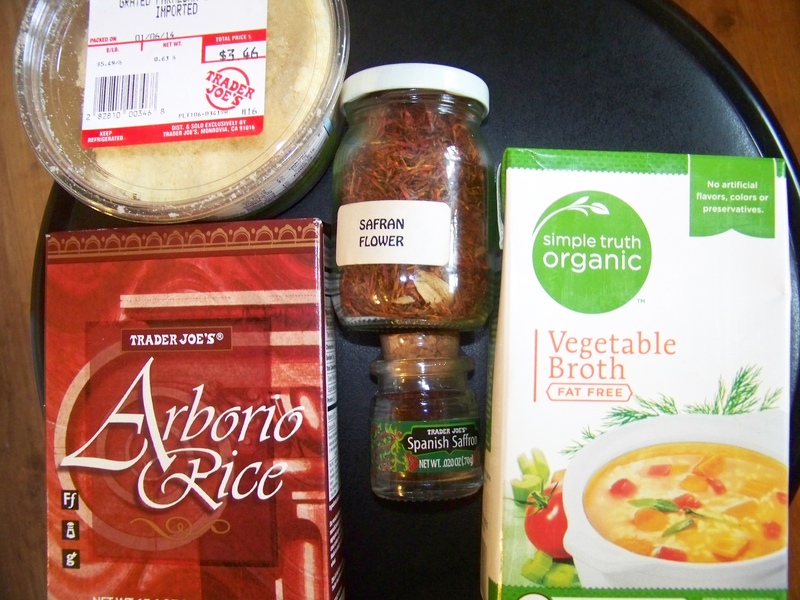 I had some that my brother had brought back from Turkey, and a little (slightly fresher, if not as exotic) Spanish saffron from Trader Joe’s, each of which made it into the final mix. Two things about risotto: First, don’t be intimidated. It’s time consuming, no doubt, but once you get your head around that, it’s really not hard to make a very tasty, elegant dish that will wow your friends (or, in this case, endear me to The Bride). 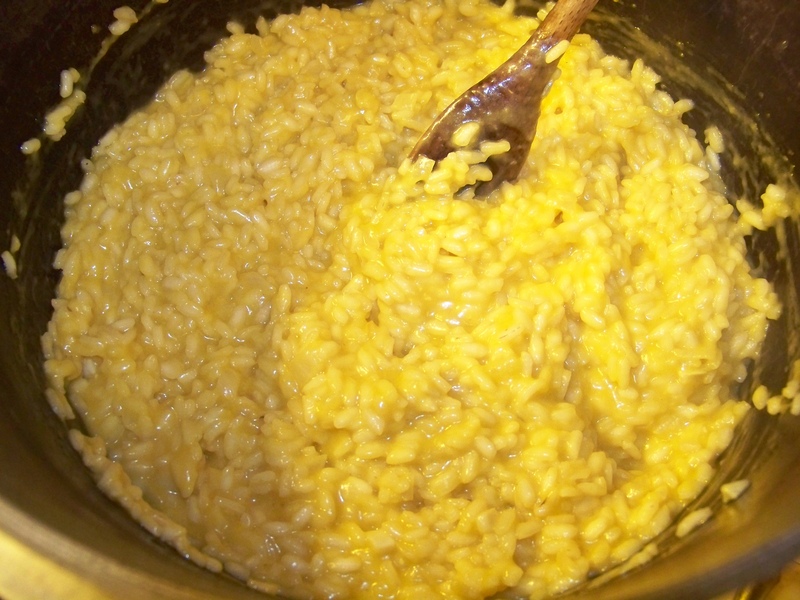 Second: There is no speed round when it comes to risotto making. Commit to stirring constantly for the better part of 45 minutes. Think of it as a kitchen meditation, where all the world’s cares drop away and you can focus on the gastronomical, physical, and spiritual union of stock and rice. 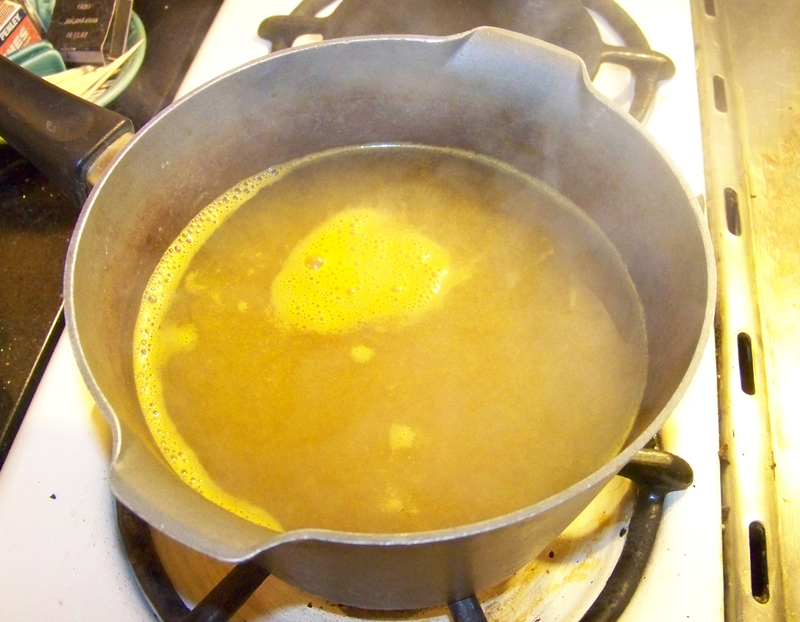 First, bring the stock just barely to a boil, then set it back to a simmer. If you have not yet defrosted the langoustine (they often to tell you to do it the night before by moving them from the freezer to the fridge, but I rarely plan that far ahead), take them from the freezer, put them in a sealed plastic bag, and set the bag in warm water. Since they will only be at this warming temp for about 40 minutes or so, you don’t need to panic about bacterial bloom or other fishy evils. 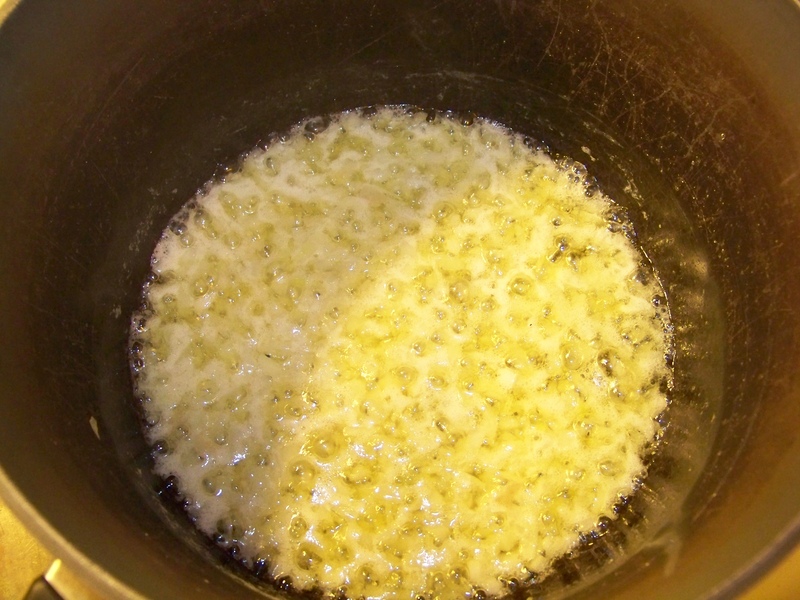 Next, heat the butter and oil in a large saucepan over low heat until foaming. Add the onion, celery and garlic, and cook, stirring, for 5 minutes or until onion softens. 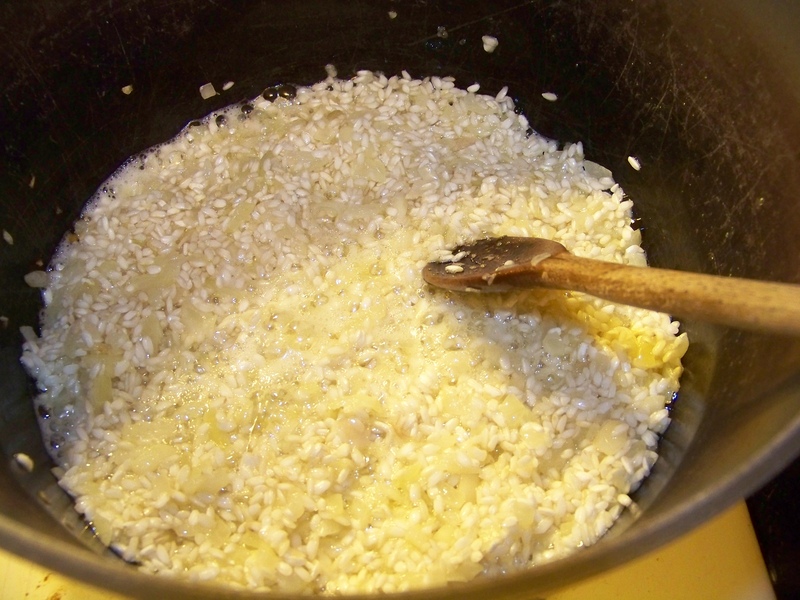 Add the rice and cook, stirring, over medium heat for 1-2 minutes or until the grains appear slightly glassy. Add a ladle (about 125ml / 1/2 cup) of the heated stock to the rice mixture and use a wooden spoon to stir until the liquid is completely absorbed. Why wood? It’s so much nicer than plastic, isn’t it? Continue to add the stock, one ladle at a time, stirring constantly and allowing the liquid to be absorbed before adding the next. Cook until the rice is just tender and the risotto is creamy (this will take at least 25 minutes — DON’T RUSH). 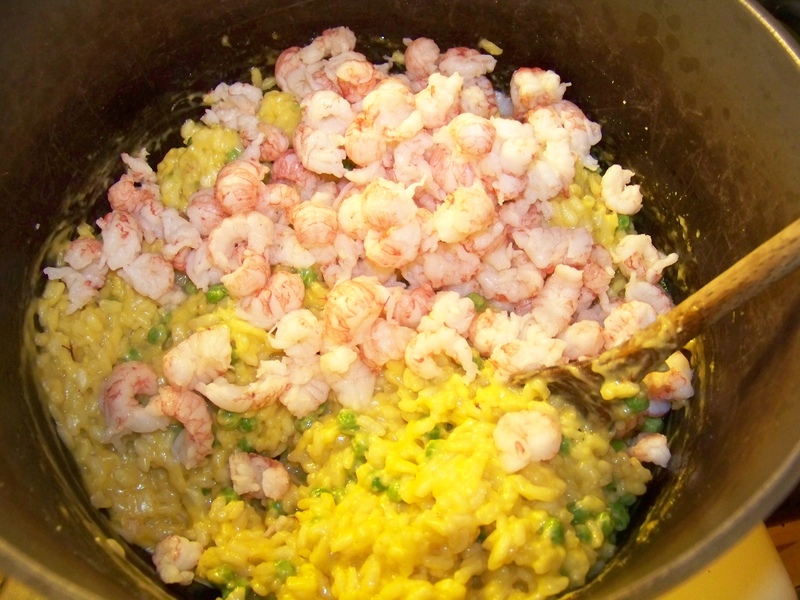 Add the langoustine, peas, and saffron, and cook, stirring, for 3 minutes or until well combined and heated through. Remove from heat and stir in the Parmesan. Taste and season with salt and pepper. Remember: the Parmesan brings its own saltiness, so have a light hand with the NaCl! You can always add more salt — even at the table — but you can’t take it away. C’est fini! Or, more appropriately, è finito. Spoon the risotto into bowls and serve immediately. Try not to consume it like a just-uncaged wolverine.